When Elsa and her dog Cody fled their domestic violence situation, RedRover provided a grant that helped fund boarding for Cody while Elsa was in a shelter. But her abuser tracked them down. He stalked the boarding facility to confront Elsa, and even attempted to take Cody with him. According to a national survey of domestic violence shelters, 85 percent of women and 63 percent of children who entered shelters reported incidents of pet abuse in their homes. Elsa and Cody finally found peace of mind when RedRover researched and worked with Elsa's advocate to find her and Cody a shelter far from their abuser. Because many domestic violence shelters do not have the space to board pets, victims are faced with an incredibly difficult choice: abandon their pet or continue to face abuse at home. 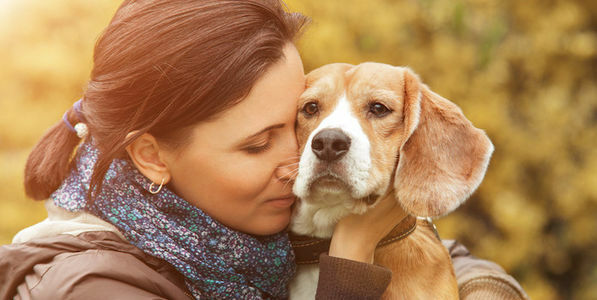 Even though they are putting their own lives at risk, up to 65 percent of victims stay in their domestic violence situation or delay leaving because they fear for their pet's safety. RedRover has set an ambitious goal of ensuring there are pet-friendly domestic violence shelters in every state by 2022. There are only six states left. We need caring and compassionate people like you to help us spread the word. Sign to show your support for the RedRover Relief Domestic Violence Assistance program today. When you sign up, you will receive updates on ways you can help create a safer world for domestic violence survivors and their pets.